I know this is long overdue, but I’ve been a little busy. At first, I was waiting for a little more information before writing it up. Then the Finding Your Roots inspired me to finish before Bernie’s episode aired, but I didn’t make it. I haven’t seen the show yet, but it’s time to finish the story. 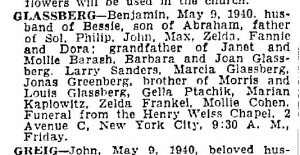 From the marriage certificate of Elias Sanders and Dora Glassberg, Bernie’s parents, in 1934, Dora was 21, born in NYC, and the daughter of Benjamin Glassberg and Bessie Greenberg. Dora, or Dorothy, was born about 21 October 1912 in New York City. I say about because the date comes from her father’s naturalization. I could not find her in the NYC Birth Index to verify. Some of her siblings were listed and their dates on the naturalization were slightly off, so I can’t be sure if hers was correct. Polish Jews at the time didn’t pay attention to birth dates, and sometimes that spilled into the first generation in the US. Dora had six siblings, including a twin sister. I realized they were twins looking them up in the US censuses, but the naturalization (found after) showed the same birth dates. Everyone in the family changed their names at some point, with the exception of Max; Max was always Max. Dora’s siblings were Sholem/Solomon/Saul, Philip/William, Jonah/Joseph/John, Max, Jennie/Sadie/Zelda, and Fannie/Fay. Their parents also had lots of name variations, her father as Berel, Bernard, Barnett, Bennie, and Benjamin and her mother was found as Braine, Bella, Fannie, Beckie, Bettie, and Bessie. Of course, some of these changes are just what the various records say and may not have been names that they actually used. Dora’s obituary also listed her siblings as Sol, Phillip, John, Max, Mrs. Sid Barash, and Fay Green. Her mother Bessie was also listed, so it appeared Bessie outlived her. I was able to find the US and NY State censuses on Ancestry, but NYC vital records were on microfilm at the FHL. I found the marriage certificates for all of her siblings except Joseph/John. (Sometimes I’m not sure which names I should use.) I also found the births for Joseph, which appears to say “Job.” (with the period) and Max. And as stated already, both of their birth dates were listed a little differently on the naturalization. Benjamin died in 1940 and is buried at the United Hebrew Cemetery on Staten Island. His parents, on his death certificate, were listed as Abraham Glassberg and Frieda Melinuch. Bessie died in 1963. Another researcher, Renee Steinig, provided that information. I was not able to get the cemetery to answer me, but she was buried in the same cemetery with Benjamin. Also at that cemetery was Benjamin’s brother Morris and his father Abraham. Benjamin’s obituary also provided a list of his children, grandchildren, siblings, and his father was named as well. I did some more research into the US records, lots of censuses and such for Benjamin’s siblings, but let’s go back in time instead. I was able to find a lot more records on this side of Bernie’s family, so much that this blog post could go on for days if I filled in all the details. Benjamin arrived to the US in 1903 as Barnett, joining his cousin, Jacob Hecht. I did not yet follow up on this cousin. Bessie arrived to the US as Branie with Phillip in June 1904. The family had been in England long enough that Philip was born there. Sholem arrived in August 1904, five years old, with Cisel Gershtein, a cousin of Benjamin’s. Another cousin that I did not yet follow up on. Abraham Glassberg, Benjamin’s father, died in 1942, the son of Louis and Sarah Feige. An online tree showed that his wife, Freida, had died in 1908, but I don’t know what the source of that was and I didn’t find a record yet. None of the trees showed Bessie’s date of death, which I thought should have been easier given that it was in the US. Abraham arrived in the US in 1914 as Abram along with his daughter Malke. From his naturalization, Abraham’s wife was Chaya Rifka and that youngest daughter became Mollie. Other children were Bennie, Sonie, Sarah Ptashek, Morris, Louis, and Zelda, and it showed he was born in Radzin. I had a few other records showing Radzin as well. I did more research on Abraham’s other children, but one held the key to the next part of the research. As I searched Radzyn Podlaski records on JRI-Poland, I could only find one record for this family indexed, the marriage of Sura Gela to Szlomo Ptaszek. There appeared to be no other records from the Glassberg family in Radzyn. 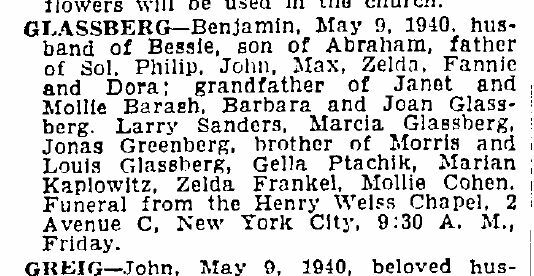 There were lots of Glassbergs, but no Benjamin, no Abraham, no Louis, no Polish variations of those names, and none of Benjamin’s siblings except for that one marriage record. The Polish archive has many records online and they had Books of Residents for Radzyn. I searched it quickly but found two pages that listed a couple of Glassberg families. One page had an Abram Glassberg born about the same year as this family’s Abram. That Abram had no vital records. And with two Abram Glassbergs born in Radzyn about the same time, they were likely cousins named for the same ancestor, but there was no Abram Glassberg at all indexed in Radzyn. I had evidence of five or six generations of this family with no vital records, except for Sura Gela who married into a family that registered their vital events. This was a blow to the research. I still scanned every Glassberg Polish record that JRI-Poland had indexed, and found nothing else that fit into this family as I knew it. Perhaps another pass through the records again, or a more recent search of JRI would find something, but back when I did all this work originally, there was nothing. I did put together a large Radzyn Glassberg family tree, but this branch didn’t show up anywhere, although there were lots of places for them to go, if I could just find some more records. Because I couldn’t find Glassberg records, and especially the marriage of Benjamin and Bessie would have been useful, I was not able to do more on Bessie’s Greenberg family either. JRI had gobs of Greenbergs indexed in Radzyn, but nothing matched her birth, and especially without her parents’ names from the marriage or a death certificate, I had nothing more to go on there. But that marriage certificate for Sura Gela Glassberg was most helpful. I had found two or three US records showing the name of Abram’s first wife, but it was only from the Polish records that I got the full name and the correct surname. She was listed a Frejda Mindla Mlynarz. Having two given names for Polish Jews at the time wasn’t all that common, besides certain names that pretty much always went together (like Tzvi Hersh, for example). But Frejda Mindla was a more unique pairing. It turned out that JRI-Poland had indexed a Frejda Mindla Mlynarz birth right about the same time that Abraham Glassberg was born. There were no other records for anyone else named Frejda Mindla Mlynarz. I did not have her age or her parents’ names to verify. So at this point, I had to make a leap that this was the same person. And then the Polish record floodgates opened. Not only did I have her birth, but I found four other siblings, her parents’ marriage in 1860, Chajm and Zelda Apeloig, his parents Berk and Sora, his parents Szymcha and Ruchla, and his parents Herszk and Kayla. Szymcha was born about 1775 and died in 1840 in Radzyn. I also filled in the rest of the family tree from the records available. I was also able to find more on Zelda’s family, her parents Lemel and Sura, his parents Dawid and Perl Malka, and his father Moszko. Dawid was born about 1789. And again, I filled in the families with all of the Polish records I could get. And thus I was able to trace some of Bernie’s family back to the time of the American Revolution. They were in Poland, but it was the same time. I’ve been able to do this with many Polish families. With the brick walls I faced with Sanders, and then even with Glassberg, I was happy to have so much more to find. I’ve obviously skipped over many more people and details, because there were so many. I ran into some online trees while I was doing this. I don’t remember it being deliberate, just that they showed up in searches. None of them were entirely correct. Morris Glassberg, Benjamin’s brother, appeared in several trees online, all of them wrong. There were at least two people with that name and about the same age, but all the trees mixed information from both. I found several that pointed to this Morris’s death index entry, but he was clearly a different Morris with different parents. I also found at least one tree showing Chaya Rifka as the mother of Abraham Glassberg’s children just because she was listed as his wife on his Petition for Naturalization, even though his Declaration of Intention stated he was widowed. I think the Geni tree was the most accurate, but even that one listed Philip and William as separate people. The URL of this blog post is http://idogenealogy.com/2017/10/04/bernie-sanders-part-2/. This blog post is part of a series. Wow, thanks so much for doing all this work! I just finished watching the Bernie episode of Finding Your Roots and was left on kind of a cliffhanger since they did not delve into his maternal line… I was worried maybe there were no records at all. This was a pleasure to read. Thanks again. Yes, I did watch that episode. And I wrote a Nitpicker’s Guide to it. You might be. Was your Chaim married to Zelda?